The right age to buy a smartphone is a tough decision for parents. Most experts suggest middle school age children are more likely to handle the responsibility of owning a mobile device. There’s little doubt over the appeal tech has for children. Each holiday, most kids are likely to fill their wish lists with the latest video games, tablets, and mobile devices. As more of their peers start showing off their own smartphones, your child may become insistent on having his or her own device. Experts warn though of buying smartphones for children who are not yet responsible enough. According to data compiled by Influence Central, the average age of children getting their first smartphone is on the decline. Back in 2012, the average age was 12. In 2016, the age is 10 with some children getting their own devices as young as 7. One reason cited for the decrease? More and more parents are tired of loaning their own devices to children eager to play the latest and greatest app. Experts can’t seem to agree whether age or maturity level should be the biggest factor when deciding on the appropriate age of ownership. According to a recent 2017 interview featuring Microsoft founder Bill Gates, he banned his own children from carrying smartphones until the age of 14. His children weren’t permitted unrestricted use after this point either. Gates went on to say he doesn’t allow cell phones at mealtimes and he sets limits on screen time. Would you describe your child as having a strong sense of personal responsibility? Does your child have a tendency to misplace important things often? Will the phone be required for safety concerns such as picking up from practice and going over a friend’s house for a sleepover? Would your child be able to follow the rules regarding the smartphone like not texting during school? Is your child the type to retreat into games and apps and not engage with others? The answers to these questions will help you make a calculated decision over whether your child is ready for a phone or not. Remind your child that the smartphone is a privilege and can be revoked due to misuse. Since you may only need a smartphone temporarily for your child, don’t get locked into a long-term mobile contract. Purchase a prepaid or month to month phone plan. Caving to peer pressure isn’t a valid reason to buy your kid a smartphone. Just because all of his or her friends seem to own one, doesn’t mean you have to purchase a device to help him or her “fit in.” Don’t buy a smartphone as a toy for your child either. If your child wishes to play mobile applications, there are kid-friendly tablets available with more restrictions in place. The bottom line is later you can wait to buy your child a smartphone the better. Videos, apps and messaging can all become addictive. If you buy a smartphone too early, you will have a harder time controlling screen time limits. 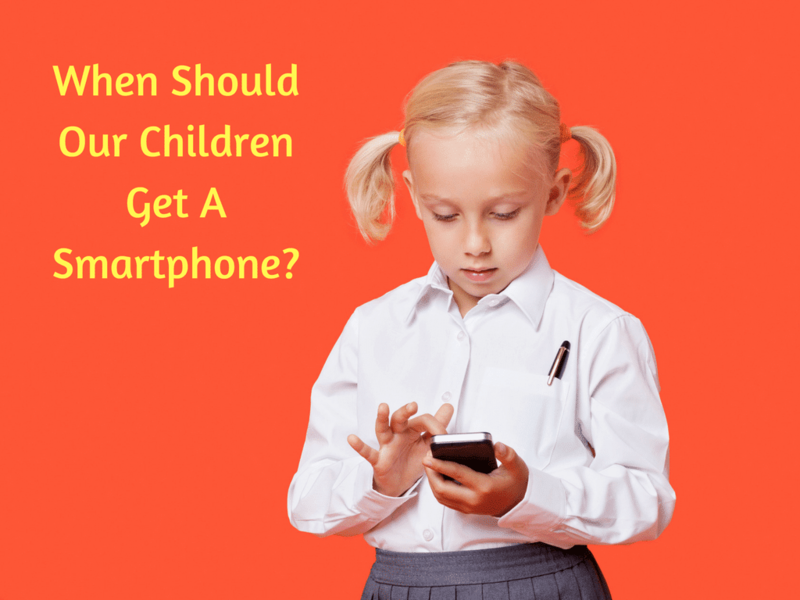 Home > Blog > What Age Should You Buy Your Child a Smartphone?